The same force that made the dollar the world’s reserve currency is working to dethrone it. July 22, 1944, marked the official conclusion of the Bretton Woods Conference in New Hampshire. It was at Bretton Woods that the dollar was officially designated the world’s leading reserve currency — a position that it still holds today. Under the Bretton Woods system, all major currencies were pegged to the dollar at a fixed exchange rate. The dollar itself was pegged to gold at the rate of $35 per ounce. Indirectly, the other currencies had a fixed gold value because of their peg to the dollar. Other currencies could devalue against the dollar, and therefore against gold, if they received permission from the International Monetary Fund (IMF). However, the dollar could not devalue, at least in theory. It was the keystone of the entire system — intended to be permanently anchored to gold. From 1950–1970 the Bretton Woods system worked fairly well. Trading partners of the U.S. who earned dollars could cash those dollars into the U.S. Treasury and be paid in gold at the fixed rate. Trading partners of the U.S. who earned dollars could cash those dollars into the U.S. Treasury and be paid in gold at the fixed rate. In 1950, the U.S. had about 20,000 tons of gold. By 1970, that amount had been reduced to about 9,000 tons. The 11,000-ton decline went to U.S. trading partners, primarily Germany, France and Italy, who earned dollars and cashed them in for gold. The U.K. pound sterling had previously held the dominant reserve currency role starting in 1816, following the end of the Napoleonic Wars and the official adoption of the gold standard by the U.K. Many observers assume the 1944 Bretton Woods conference was the moment the U.S. dollar replaced sterling as the world’s leading reserve currency. In fact, that replacement of sterling by the dollar as the world’s leading reserve currency was a process that took 30 years, from 1914 to 1944. The real turning point was the period July–November 1914, when a financial panic caused by the start of the First World War led to the closures of the London and New York stock exchanges and a mad scramble around the world to obtain gold to meet financial obligations. At first, the United States was acutely short of gold. The New York Stock Exchange was closed so that Europeans could not sell U.S. stocks and convert the dollar sales proceeds into gold. But within a few months, massive U.S. exports of cotton and other agricultural produce to the U.K. produced huge trade surpluses. Gold began to flow the other way, from Europe back to the U.S. Wall Street banks began to underwrite massive war loans for the U.K. and France. By the end of the First World War, the U.S. had emerged as a major creditor nation and a major gold power. The dollar’s percentage of total global reserves began to soar. The significance of the process by which the dollar replaced sterling over a 30-year period has huge implications for you today. Slippage in the dollar’s role as the leading global reserve currency is not necessarily something that would happen overnight, but is more likely to be a slow, steady process. Signs of this are already visible. In 2000, dollar assets were about 70% of global reserves. Today, the comparable figure is about 62%. If this trend continues, one could easily see the dollar fall below 50% in the not-too-distant future. It is equally obvious that a major creditor nation is emerging to challenge the U.S. today just as the U.S. emerged to challenge the U.K. in 1914. That power is China. The U.S. had massive gold inflows from 1914-1944. Although China’s gold purchases may have fallen off recently, it has been experiencing massive gold inflows. Gold reserves at the People’s Bank of China (PBOC) increased to 1,842 tonnes at the end of 2016, according to the China Gold Association. That’s up 11% from the 1,658 tonnes it held in June, 2015. But China has acquired thousands of metric tonnes since without reporting these acquisitions to the IMF or World Gold Council. Based on available data on imports and the output of Chinese mines, actual Chinese government and private gold holdings are likely much higher. It’s hard to pinpoint because China operates through secret channels and does not officially report its gold holdings except at rare intervals. China’s gold acquisition is not the result of a formal gold standard, but is happening by stealth acquisitions on the market. They’re using intelligence and military assets, covert operations and market manipulation. But the result is the same. Gold’s been flowing to China in recent years, just as gold flowed to the U.S. before Bretton Woods. China is not alone in its efforts to achieve creditor status and to acquire gold. Russia has greatly increased its gold reserves over the past several years and has little external debt. The move to accumulate gold in Russia is no secret, and as Putin advisor, Sergey Glazyev told Russian Insider, in April 2016, ‘The ruble is the most gold-backed currency in the world’. Iran has also imported massive amounts of gold, mostly through Turkey and Dubai, although no one knows the exact amount, because Iranian gold imports are a state secret. Other countries, including BRICS members Brazil, India and South Africa, have joined Russia and China to build institutions that could replace the balance of payments lending of the International Monetary Fund (IMF) and the development lending of the World Bank. All of these countries are clear about their desire to break free of U.S. dollar dominance. Sterling faced a single rival in 1914, the U.S. dollar. Today, the dollar faces a host of rivals. In addition, there is the world super-money, the special drawing right (SDR), which I expect will also be used to diminish the role of the dollar. The U.S. is playing into the hands of these rivals by running trade deficits, budget deficits and a huge external debt. The decline of the dollar as a reserve currency started in 2000 with the advent of the euro and accelerated in 2010 with the beginning of a new currency war. 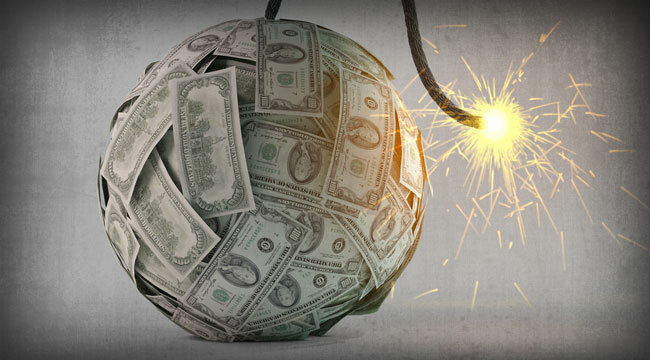 In his 1925 poem The Hollow Men, T. S. Eliot writes: “This is the way the world ends/ Not with a bang but a whimper.” Those waiting for a sudden, spontaneous collapse of the dollar may be missing out on the dollar’s less dramatic, but equally important slow, steady decline. The dollar collapse has already begun. The time to acquire inflation insurance is now.